Over the years, I've been exposed to many claims about how the brain works and how this knowledge can be applied in education. This is clearly true. Learning occurs in the brain. However, this fundamental premise does not lead to the conclusion that all claims about the brain and how it applies to education are true. How are we to decide what to believe? The first two "tests" are different, but equal. Depending on the background knowledge you have about a claim, you'd pick one or the other. That is, some claims might seem plausible to people without much background knowledge. In this case a quick google might be the best course of action. 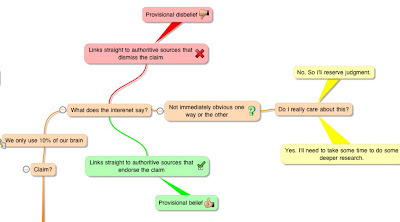 Other claims would be immediately dismissed as implausible by someone with the required background knowledge, so a google search is unnecessary. The third test only comes in to action when the first two tests are passed. If a quick google doesn't resolve the truth of the claim, or it sounds plausible, then deeper research is required. 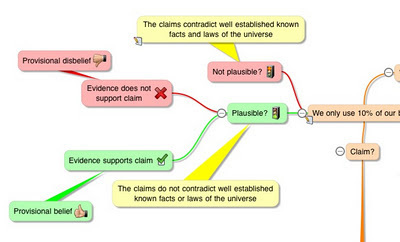 We need (high quality) empirical evidence. I'm constantly amazed at the seeming inability, or unwillingness (if I'm being fair), of people to google. There are some claims that are checked with a 30 second google search. Take, for example, the factiod that we only use 10% of our brain. Snopes (check), Wikipeda (check), Scientific American (check), and boom, myth busted. No need to move on. As the Snopes article and the Wikipedia entry explain, the claim that we only use 10% of our brain is a biologically implausible. If I had a background in biology, I’d have already known, for example, that brain imaging shows all the brain is active, brain injuries lead to a loss of function, and evolution by natural selection is a merciless process that would eliminate such a wasteful inefficiency. Thus my background knowledge allows me to dismiss this claim as implausible without heading to google. 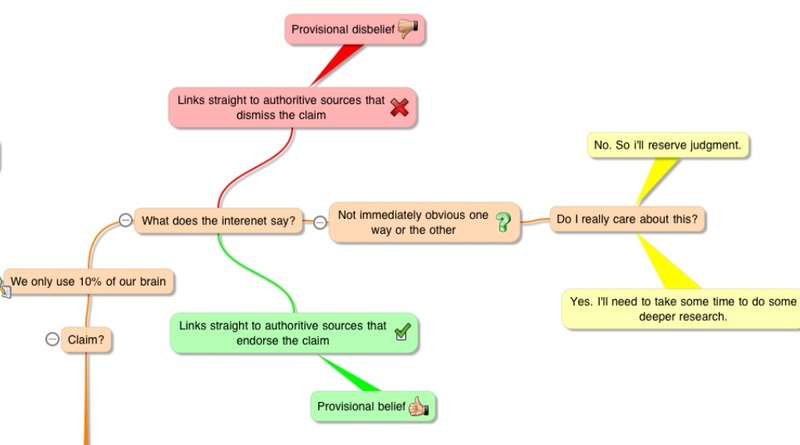 These two ways of evaluating a claim are very simple, and work well for claims that have a black and white answer. Of course, many claims aren't so black and white. In two more posts I’ll apply the same logic to claims about the brain and learning that are not as easily dismissed. Part two will look at “Brain Gym”, which lacks plausibility, but isn't immediately dismissed when doing a quick google. In Part three I will look at “Learning styles”, which again, isn't resolved with a quick google, but compared to Brain Gym, seems very plausible.